New ideas about how the solar system took shape are helping astronomers tackle a planetary puzzle — why Mars is so much smaller than its rocky neighbor worlds. Models show that the Red Planet should be about as big as Venus and Earth if gas and dust were distributed relatively smoothly throughout the protoplanetary disk that surrounded the newborn sun 4.5 billion years ago. But Mars is just 10 percent as massive as these two other worlds, suggesting that it formed in a region relatively depleted of planet-forming material. 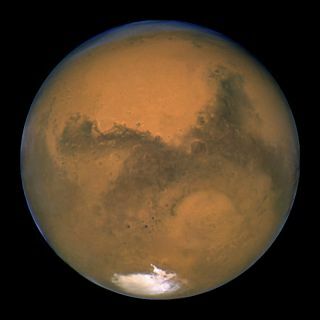 Two different theories that seek to explain why Mars is just 10 percent as massive as Earth and Venus. The Grand Tack idea holds that Jupiter and Saturn migrated toward the sun shortly after they formed, then headed back out toward the outer solar system once again. These movements would have swept lots of material up from Mars' neck of the cosmic woods or scattered it away. But a team of researchers, led by Andre Izidoro of the Universidade Estadual Paulista in Brazil, proposed an alternative idea in a paper published in February in The Astrophysical Journal. Simulations of gas flow in the solar system's early days suggest that a low-density region may have naturally existed in the protoplanetary disk between 1 and 3 AU from the sun, the researchers noted. "If this partial gap survived long enough, it could have been preserved in the distribution of planetesimals and planetary embryos that formed subsequently," Chambers writes. "The simulations performed by Izidoro show that reducing the number of planetary building blocks near Mars’ current orbit by 50 to 75 percent favors the formation of a puny Red Planet." Interestingly, both of these ideas — Grand Tack and "natural gap" — posit that Mars first began taking shape at around 1 AU, near Earth's present orbital position, Chambers adds. Gravitational interactions then pushed the Red Planet outward to its current location, where the lack of raw material stunted its growth. It may be possible to determine which of these two scenarios more accurately depicts reality. For example, the idea presented by Izidoro and his team predicts that asteroids in the main belt between Mars and Jupiter coalesced pretty much where they sit today. "In the Grand Tack model, the asteroid belt was purged at a very early stage, and the surviving members sample a much larger region of the solar nebula," Chambers writes. "These differences may help us distinguish between the models in future." But there's also the possibility that both of these models are off-base, and that Mars' puniness is just a strange cosmic accident. "Conventional planet-formation simulations generate respectable Mars analogs in a few percent of cases without requiring any special measures," Chambers writes. "This leaves the slim possibility that Mars represents a bizarre statistical outlier, and its small size contains no deeper truths about our solar system."